Hua Hin has many local markets, the most popular one being the night market in the center of town. It opens daily from around 6pm till late and offers all sort of food, clothing, and wooden carving for tourists. 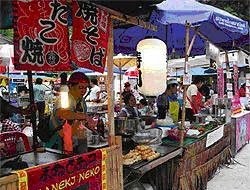 This market is visited by many tourists and therefore prices are a bit higher that other local markets. 1) Chat Chai day market is just along from the night market and is mostly undercover. Here you can buy fruit, vegetables, fish, and meat at local prices. It is fun to stroll around the dim aisles that make up the market complex. 2) The weekend market at the Grand Hotel runs from Thursday to Sunday and offers something different again. Here you can shop for clothes, books, plants, toys, pets and tropical fish. This is another evening market starting at around 6pm. 3) Possibly the best and the largest market in Hua hin is at Pae Mai on Tuesdays (across the railway next to the driving range). This one gets very busy and is extremely popular with the locals, here you can get anything; fresh produce, clothing, motorcycle accessories, electrical appliances, tools, household items and much more. It is well worth a visit. 4) In the Khao Takiab area there is sea food market open daily early in the morning. You can buy here fresh or ready cooked food. 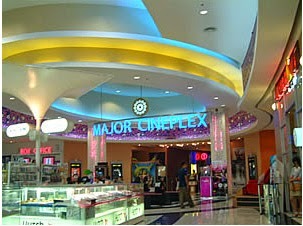 There are two big shopping malls in Hua Hin. but most of the shops are small and privately owned. Many of these are located along the roads near the Sofitel and Hilton hotels. For local handicrafts, the Hua Hin Bazaar, about 100 meters west of the beach, should be your first stop.There are hundreds of items in the shops with everything from shells and wood carvings to dried fish. All along Naresdamri Road up to Chomsin Road there are shops and tailors and restaurants. There are several silver shops on Chomsin Rd. There are many tailor shops in Hua Hin offering very competitive prices on western suits and dresses made from a wide variety of cloths. Suits can be made in 24 hours and the prices are very competitive. The recently opened Rashnee Silk Village on Naebkehard road is worth a visit. The place re-creates the ambience of a traditional Thai silk weaving rural village, there is a history of silk display, silk making processes and a general effort to increase awareness about Thai silk and its origins. On the way back to Bangkok it is worth to stop at one or both factory outlets near Phetchaburi. You can buy there mainly cloths produced on export to Europe at discount prices.